I’ve been working on organizing and trying to use up some of the jewelry making and crafting supplies that I feel like have been hiding in my drawers for years, when I came across some leather scraps in my studio that I’ve literally had in my stash for about a decade. I remembered an idea I saw on pinterest a while ago, and started playing with it. 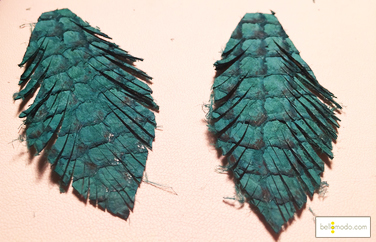 I created a number of various earrings at home with these leather scraps, but my favorites ended up being the ones that were made to look like feathers (again – I stole this idea from Pinterest, not sure who did them originally). So, the other day I was in the shop at Bello Modo and spotted the Fish Leather, sometimes called Sea Leather! 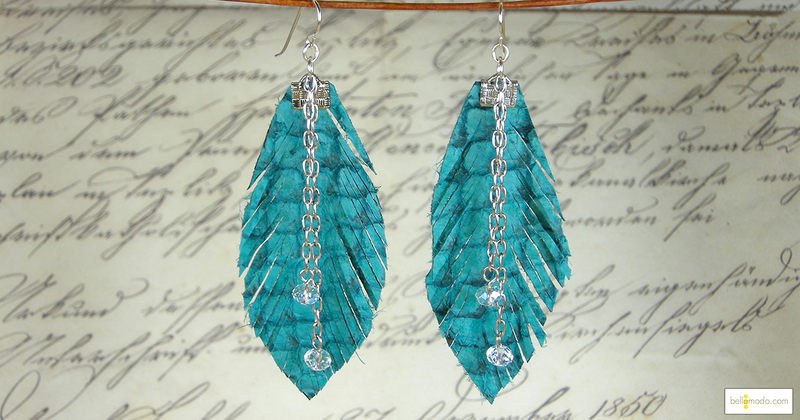 This leather is so much prettier and more colorful than what I was using at home (plus it is ECO friendly), so I decided to re-create my earrings project with the fish leather and share it with you! I made a couple different pairs to show you how you can switch the look of them up easily, but the base is the same! First, I took the cover of an old notebook and cut out just the right size and shape that I wanted for the earrings to use as a template for cutting the shapes out of the leather. 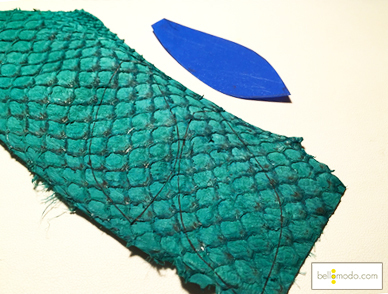 I used this to trace the shape onto the fish leather, and then cut them out. Next I took a nice, sharp scissors and cut the leather at a sharp angle up so the pieces resemble a feather. In the multiple pairs I made, I found that the sharper the angle I cut them at, the more I liked the look (i.e. angle the cuts up). The more cuts you make, the more feather-like they look. I used the 10mm basketweave crimps at the top. I’m not sure that it was necessary, but I did put just one drop of Super New Glue on the back side before crimping them down with my nylon jaw pliers. From here, you can decorate them any way you wish! 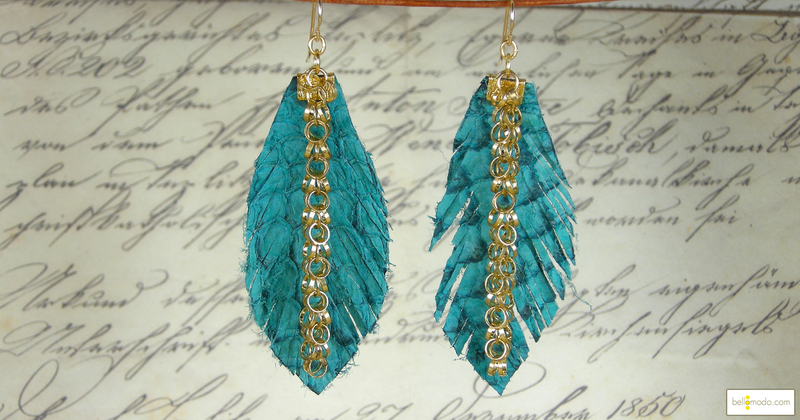 Below I have a listing of the materials I used for each pair I made here. I love the look of both of these. I think they could even look nice without cutting them to look like feathers. Feel free to mix it up and try other shapes. 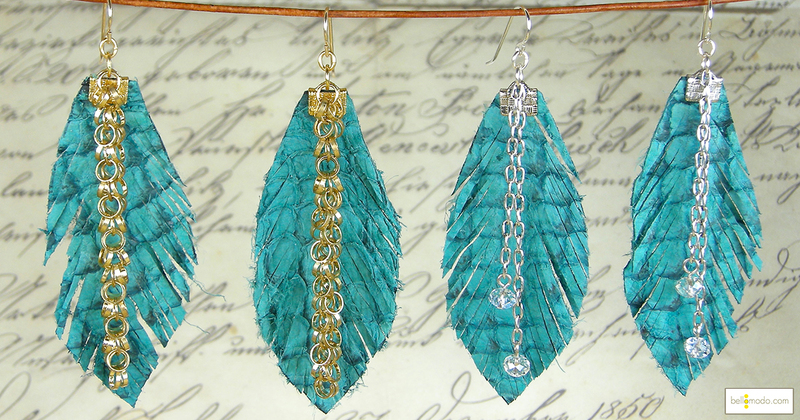 Or you could try layering a couple of different shapes and/or colors. What would you do? Editors Note: I think it would look nice if you ran a line of stitching up the center of the feather, to help define it a bit more and add another textural element. And just in cast you were wondering… it does not smell at all, even though its made of fish hides. It’s also super malleable and soft!